OjiFS Yatala opened its doors to a group of eager AIP members, keen to see the sophisticated corrugated packaging converting facility in actions. The Australian Institute of Packaging enjoyed an exclusive tour of OjiFS' $72m state-of-the-art corrugated packaging converting facility in Yatala yesterday. PKN was there. As the first official tour group to pass through the doors since the Oji Fibre Solutions Yatala plant's official opening in late February, AIP members were treated to an in-depth 'reveal' of the highly automated converting facility and the world-leading equipment it houses. A greenfield development, the plant is the first 5-star Green Star rated building in Australasian manufacturing industry (rated by the Green Building Council Australia), according to AIP's host for the day, Jason Cairns-Lawrence, OjiFS state sales manager (Qld). Cairns-Lawrence explained that the purpose-built plant's green credentials include a 75,000-litre rainwater harvesting system to reduce potable water consumption by 80%, optimum energy efficiency including a 100kW Solar PV system (with balance exported to grid), daylight sensors and a lighting control system. Commenting on the choice of the site's location, Phillip Nuttall, OjiFS national sales and marketing manager said that it was highly strategic. 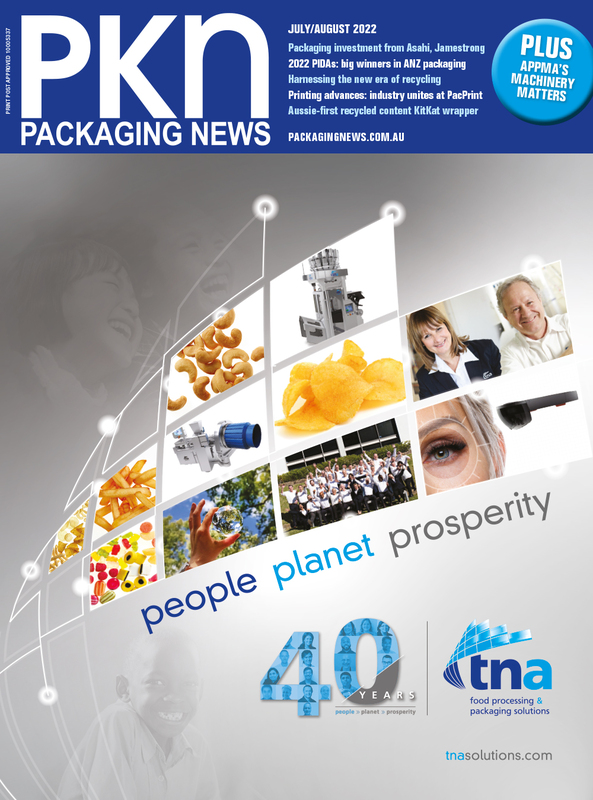 Queensland is now the second largest market for corrugated packaging after Victoria, and the investment marks a major step foward for the group in growing its footprint on the eastern seaboard. OjiFS is now strongly positioned as a serious third player challenging competitors Visy and Orora. Major growth markets are meat and horticulture, he said, with many OjiFS customers seeing increased demand in export markets. Taking a closer look at the machines installed in the new facility, the German built BHS corrugator (currently in commissioning phase), can take a maximum width of 2500mm and operates at a maximum speed of 350m/minute. It has a double-cutting system and its estimated monthly production will be 5 million m2 on a one-shift basis. The board produced is Power Ply, a high strength barrier board ideal for meat and fresh produce. Other big ticket items are the Mitsubishi EVOL (FFG) four colour flexographic printer operating at speeds of up to 350 kicks/minute and accommodating flat sheet dimensions of 950mm x 2555mm; and the 3-colour Bobst DRO (FDC) with speeds of 183 kicks/min, a Bobst specialty gluer and an Esko Konigsberg table and digital cutter. OjiFS is owned by Japan's Oji Holdings Corporation which is headquartered in Tokyo and is the 5th largest pulp and paper company in the world with an annual turnover exceeding US$13 billion. Oji Holdings Corporation operates in 17 countries worldwide with 158 subsidiary businesses. PKN will publish a comprehensive feature on the facility and the OjiFS business in the May-June print issue.